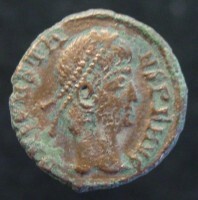 ** In order to become proficient at this method of cleaning, I would recommend practicing on some cull/broken coins. One of the gentlest methods of cleaning coins is using distilled water (DW) soaks. 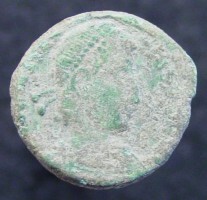 This requires that you soak the coin for 24 hours remove the coin and gently scrub the coin with a soft toothbrush. Change the water and then repeat until the coin is clean. Distilled water contains almost no dissolved minerals. When you put a coin in DW the minerals on the coin transfer to the water until the DW is saturated with minerals. Soak your coins in soap and water and gently scrub the coin with a soft toothbrush. Repeat until the coin is clean. Soap works by lowering the surface tension of water allowing the water to penetrate the dirt, by emulsifying grease, and by absorbing dirt into the foam. Place your coins in a container and cover coins completely with olive oil. Allow to soak for 1 to 6 months or longer. Change oil if it becomes discolored. After the soak period clean the coins with soap and water and gently scrub the coin with a soft toothbrush or clean mechanically if required. Repeat until the coin is clean. NOTE: to clean the oil off of the coins a detergent specifically designed to remove oil and grease may be required. 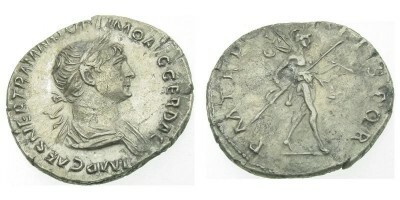 Gringgotts Coin Cleaner has been recomended. Do not use any cleaner that contains chlorine. 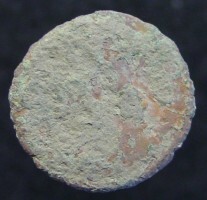 The oil penetrates the dirt and loosens it from the coin. Use brushes, toothpicks, bamboo skewers, dried rose thorns, and for the more experienced coin cleaner, battery-powered Dremel Diamond-dusted bits and dental picks to loosen and remove dirt. Work from the outer edge of the coin to the center of the coin. 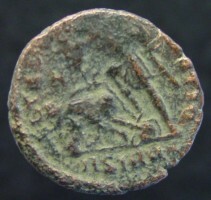 Using a tool to physically dislodge or scrape the dirt off of a coin. Using a toothpick, apply Calgon® to the oxidation and encrusted spots on the coin taking care not to get the Calgon® on the patina. Let it set for a few minutes then rinse. Use a toothbrush or a toothpick to dislodge the oxidation. Repeat until the coin is clean. Calgon® is designed to be used as a water softener with high mineral content water. Calgon® "removes" hard water minerals from water. To make your own silver coin cleaning solution, mix one part ammonia to six parts water. Soak coin in solution then gently scrub the silver coin with a small soft toothbrush to loosen dirt. Be careful not to scratch the metal. Always rinse after cleaning. Repeat until the coin is clean. 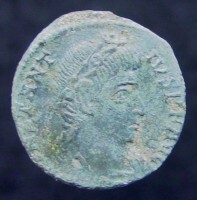 Be careful not to use ammonia on silvered or fourree coins or coins with a high bronze content. An alkaline gas composed of nitrogen and hydrogen. Aqueous solutions of with 5-10% ammonia are sold as household ammonia. Best for cleaning oily dirt. Best used as a spot application to oxidation to soften and break it up. Do not allow it to come in contact with the patina as the patina is a form of oxidation. Always rinse after cleaning. Repeat until the coin is clean. 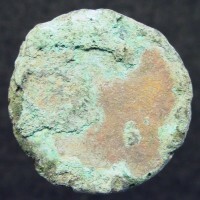 Ususally the coin is corroded under the oxidation and will have lost all detail. CLR is a diluted acid that removes calcium, lime & rust. A home or commercial ultrasonic cleaner unit is required to clean coins in this manner. Dip the coin in solution for 1-3 minutes to clean the surface of the coin. 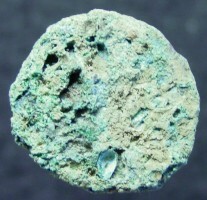 Home units are usually not powerful enough to clean heavily encrusted coins. Commercial ultrasonic cleaners can be much more effective, but may damage the surface of the coin and leave it pitted. Ultrasonic cleaning applies intense, high-frequency sound to liquids, producing intimate mixing and powerful chemical and physical reactions. The process ("cavitation") is, in effect, "cold boiling" and results from the creation and collapse of countless microbubbles in the liquid, producing shock waves. A solution of 5-30 percent formic acid in de-ionized water is effective for dissolving copper compounds without affecting silver chlorides. 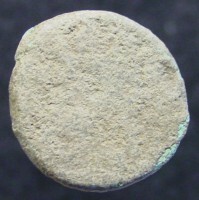 Formic acid can also be used to brighten silver that has already been cleaned with another chemical or technique. Always read and follow manufacturer directions that come with any chemicals. Using special tumbling medias such as pecan shells or stainless steel shot, the coins are mixed in and tumbled until they are clean. 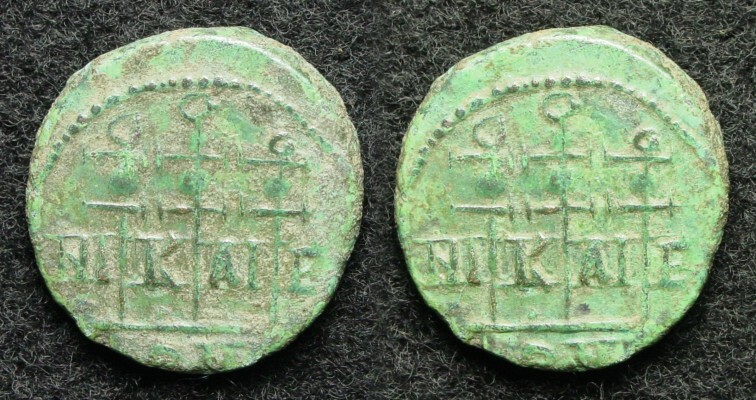 This process can damage ancient coins but is very good when used on modern coins that have not been subject to centuries of corrosion. Rotary or vibratory tumbler is used to knock dirt and deposits off of the surface of the coin. Electrolysis is a very quick and efficient way of cleaning coins, unfortuantely, it will often clean the patina off the coin. Electrolysis can clean a coins so well that it will reveal pitting and scarring that may not have been visible under the dirt or patina. Because of the dangerous chemicals given off when using salt (chlorine) as an electrolyte and stainless steel (chromium) as a cathode or annode, it is highly recomended that sodium carbonate or sodium bicarbonate (baking soda) are used instead of salt and carbon or copper conductors instead of stainless steel. You should never use any solution that contains chlorine around coins as it will damage the coin and promote bronze disease in bronze coins. In order to make a simplest of electrolysis machines you will need a 9V battery, 2 copper wires, distilled water, and baking soda. 1. Mix one tablespoon of baking soda in about 1 pint of water. 2. Connect one copper wire to the positve (+) end of the battery and put the other end in the baking soda solution with the insulator stripped back about an inch. 3. Connect the other copper wire to the negative (-) end of the battery and wrap the other stripped end of the copper wire around the coin so that it makes a good connection to the coin. 4. Put the coin on the wire in the baking soda solution, but not touching the other wire. 5. The coin and wire should begin to bubble and the dirt and corrosion should loosen and fall off. 6. 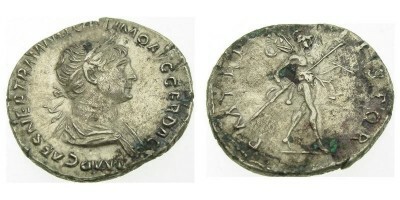 After a few minutes, remove the coin and gently clean with a paper towel. Even the best "zapped" coin takes a lot of work, and specialty tools, to complete the "after-electrolysis" cleaning and final preservation. 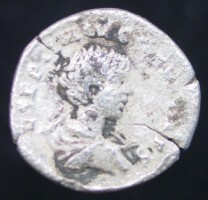 The best way to preserve you coin is with Renaissance Micro-Cryystalline Wax Polish, used by the British Museum. One 200ml can will last a lifetime. Other methods include: Kiwi Neutral Shoe Polish and other waxes. Inorganic deposits: For our definition, inorganic deposits are: deposits that are soluble (can be dissolved) but are not alive and did not come from a living organism. The trick is to clean the unwanted inorganic deposits while saving the patina (which is a form of oxidation). We know that there are many more methods and new ones being discovered every day. If you have any cleaning methods you would like to share, please email us. click here to email us.